Canon 800m f/4 L IS lens with the 1.4X II TC and the EOS-1D MIII. ISO 400. Evaluative metering +2/3 stop: 1/200 sec. at f/10. Here, off the top of my head and in no particular order, are my top ten tips for improving your bird photography. 1: Buy the best equipment that you can afford and learn to use it. 2: Use a sturdy tripod with your longest lens. 3: Using a camera body strap, keep a camera mounted to a shorter intermediate telephoto lens (or a telephoto zoom lens) on your shoulder. This will allow you to be ready almost instantly for flight and action situations and will give you lots of framing flexibility when creating bird-scapes of images of large flocks of birds in flight. 4: Become a better naturalist. The more you know about your subjects the better your images will be. 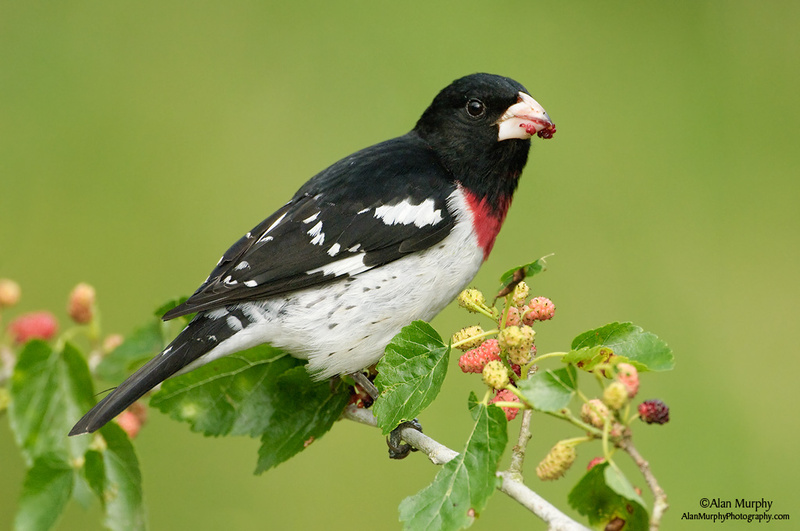 Learning tons about bird behavior and migration will vastly improve your photography. 5: Study and practice. There is a wealth of great info around today that I only wish had been available in 1983. Digital has made learning ten times easier, but you still have to study and practice.... Resources; click here: https://store.birdsasart.com/shop/category.aspx?catid=10 and follow the links. 6: Take a photo tour with a good instructor and/or attend a seminar. 7: Move slowly and get low when possible. 8: Work on your Photoshop skills. I see lots of good photographs ruined instead of improved in Photoshop. Resources: ABP II & Digital Basics: https://store.birdsasart.com/shop/category.aspx?catid=32 and APTATS: https://store.birdsasart.com/shop/item.aspx?itemid=54. For CS4: https://store.birdsasart.com/shop/item.aspx?itemid=258. 9: Look at as many good (and bad) images as possible. Critique each image that you see. Actually writing critiques of the work of others can help you improve by leaps and bounds. Joining and participating on BPN will allow you to do all of the above. 10: Subscribe to BAA Bulletins. Visit the BLOG. Join and participate actively on BPN. Canon 800m f/4 L IS lens with the 1.4X II TC and the EOS-1D MIII. ISO 400. Evaluative metering +1 1/3 stops: 1/400 sec. at f/10. Here is yet another that was created from my Sequoia with the 800 supported by the BLUBB (BAA Big Lens Ultimate Beanbag): https://store.birdsasart.com/shop/category.aspx?catid=16. For birds on high perches I raise the vehicle window to reduce the angle of inclination to the bird. 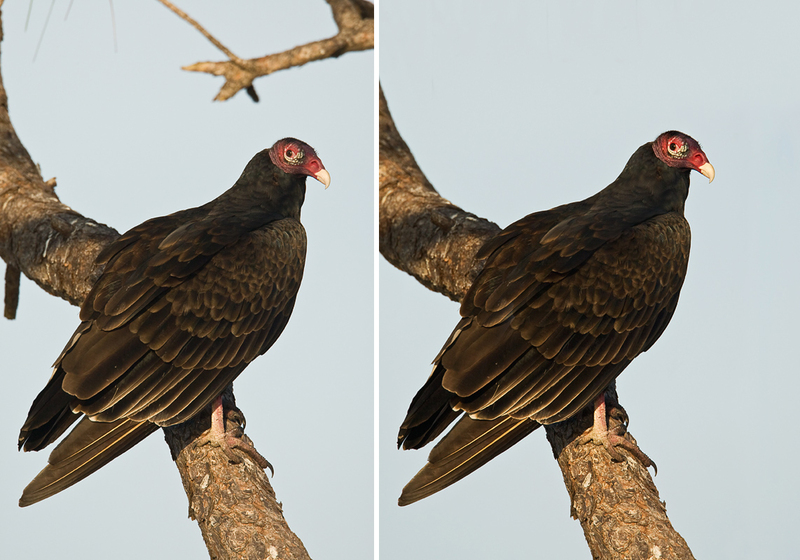 The original capture is on the left, the optimized file on the right. Here I used the “Composition Correction: Increase Lead Room Without Cropping/Basic” technique described in detail on Robert’s brand new APTATS II CD to move the bird down and back in the frame to improve the composition. All without having to add canvas. Total time to move the bird: less than 30 seconds. Total time in Photoshop mostly to do the Linear Burn on the perch: less than two minutes. BIRDS AS ART is proud to announce that we are currently accepting pre-publication orders for Robert O’Toole’s APTATS II CD (Advanced Photoshop Tips and Techniques Simplified II). Unlike APTATS I, APTATS II will be a professionally designed, packaged, and burned CD. We are striving to have them here at BAA in time to ship them before the holiday season. APTATS II will sell for $30 plus $3.00 shipping and handling to US addresses. Shipping to Canada is $6.00. It is $8.00 for all foreign orders. Florida residents will need to add 7% sales tax ($2.10) on the cost of the CD only. Here is still one more made with the help of the BLUBB (BAA Big Lens Ultimate Beanbag): https://store.birdsasart.com/shop/category.aspx?catid=16, this time with the window completely lowered. Again, the original capture is on the left, the optimized file on the right. Even though I correctly used 45-Point, I placed the bird too far forward in the frame for a pleasing composition. This is a common occurrence; using Roberts the “Composition Correction: Increase Lead Room Without Cropping/Basic” technique alone will save me hours of processing time each month. Using the new method allows you to do in 30 seconds what it used to take you two-three minutes to do using Quick Masking techniques. I removed the feather fluff from the tip of the bill by working large and using two Quick Masks as described in APTATS I: https://store.birdsasart.com/shop/item.aspx?itemid=54. Total time to move the bird: less than 30 seconds. Total time in Photoshop mostly to clean the tip of the bill: less than two minutes. LOCATION: Cox Arboretum, 6733 Springboro Pike, Dayton, OH 45449 (937-434-9006) Limit: 48/Openings: 24. Canon 800m f/4 L IS lens with the 1.4X II TC and the EOS-1D MIII. ISO 400. Evaluative metering +1/3 stop: 1/800 sec. at f/10. 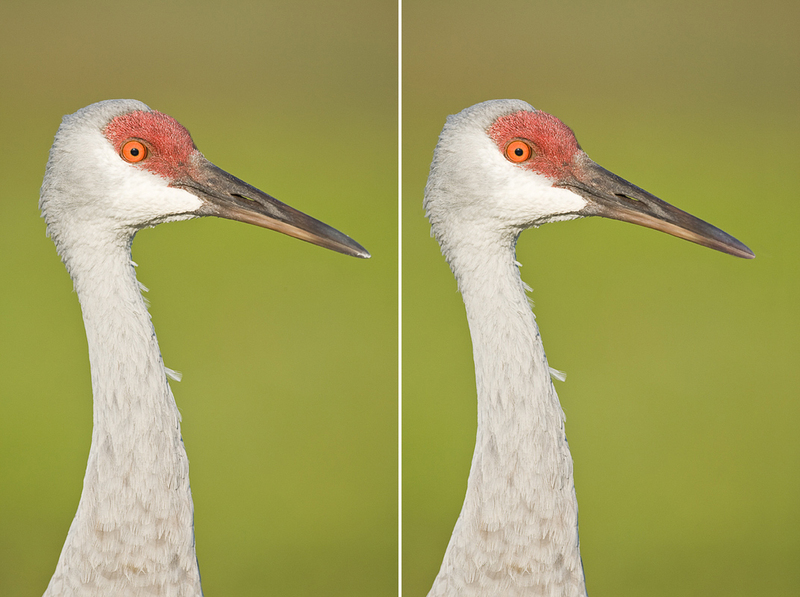 The original capture is on the left, the optimized file on the right. Here I used a combination of techniques detailed in APTATS I (https://store.birdsasart.com/shop/item.aspx?itemid=54), APTATS II (just announced: see info above), and Digital Basics (https://store.birdsasart.com/shop/item.aspx?itemid=252). Total time in Photoshop: less than 4 minutes. For technical details, please see Alan’s BPN post here: http://birdphotographers.net/forums/showthread.php?t=48312 Alan has spent more than a decade perfecting his set-up techniques. Available December, 2009. Order now; save $10.00. See below for details. The pre-publication discount will be available only to the first 500 folks. We are currently at 427. When we reach 500 we will continue to accept pre-orders at the full price. BIRDS AS ART is currently accepting pre-publication orders for Alan Murphy’s Guide to Songbird Set-Up Photography (SSUP). The professionally designed, packaged, and burned CD will be available some time in December, 2009. It will sell for $50 plus $3.00 shipping and handling to US addresses. Shipping to Canada is $6.00. It is $8.00 for all foreign orders. Florida residents will need to add 7% sales tax ($3.50) on the cost of the CD only. 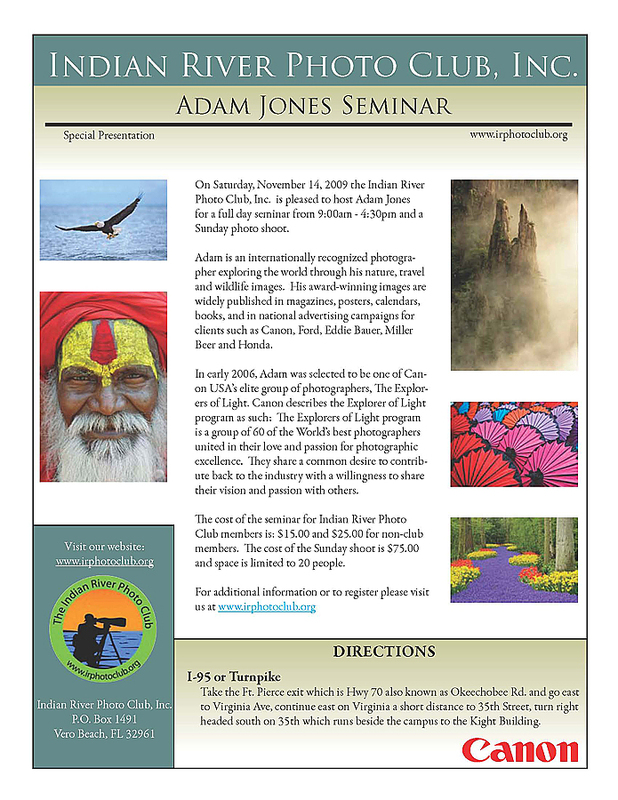 The Indian River Photo Club is pleased to host Canon Explorer of Light photographer Adam Jones on Nov. 14th, 2009. This full day seminar will be held at the Indian River State College's Kight Center for Emerging Technologies in Fort Pierce, FL from 9:00 am to 4:30 p.m. On-line registration and payment info is available here: www.irphotoclub.org. Canon 400m f/4 IS DO lens handheld with the EOS-1D MIII. ISO 400. Evaluative metering +2/3 stop: 1/1000 sec. at f/5.6. This image was the camera that is offered for sale above. 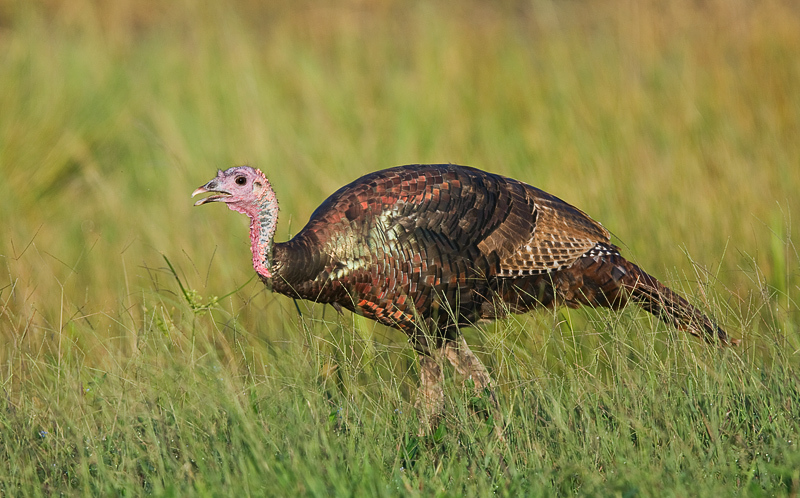 I got out of the SUV because the turkeys around here are tame and I wanted to reduce the impact of the grasses. David McNicholas is offering a used Canon 100 - 400 mm f/4.5 - 5.6 L IS USM lens in excellent shape with the lens case, and lens hood in the original box with the original manual. It is a one-owner lens that has been sitting on the shelf since I started using the 400 mm f/4 IS DO lens. I am asking $1100 for it and will ship it insured at buyer’s expense. Contact David by email at dmcnicholas@comcast.net or give him a buzz at 239-352-0616 or on his cell: 973-452-4940. Flight School Photography Goes to Bosque Workshop -2: November 14, 2009 thru November 16, 2009. 1 Opening: late registration discount price: $675. Contact Info: You may contact Jim Neiger of Flight School Photography via phone or email: Cell phone: 407-247-5200. Email: jimn@cfl.rr.com Flight School website: www.flightschoolphotography.com. Jim has two used Canon camera bodies for sale and will consider a 7D in trade (valuing it at $1600). 1-Canon EOS 1D Mark II N - includes charger, battery, 3 extra batteries, and everything that came with the camera when new. $1800 or best acceptable offer. 2-Canon EOS 10D - includes battery grip, charger, 2 batteries, and everything that came with the camera when new. $225 or best acceptable offer. Both of the above bodies work perfectly and are in excellent condition and may be returned for full refund within 10 days for any reason. The buyer pays all shipping charges. Please contact Jim via email at JimN@cfl.rr.com with questions or offers. All reasonable offers considered. While birding a few years ago during spring migration, I ran into a lady named Sally. We stood on the famous boardwalk at Magee Marsh on the shore of Lake Erie and watched hundreds of warblers move through the trees just above our heads. It was an incredible day there and we didn't move from that spot for 2 hours. We just watched the birds and engaged in friendly conversation. 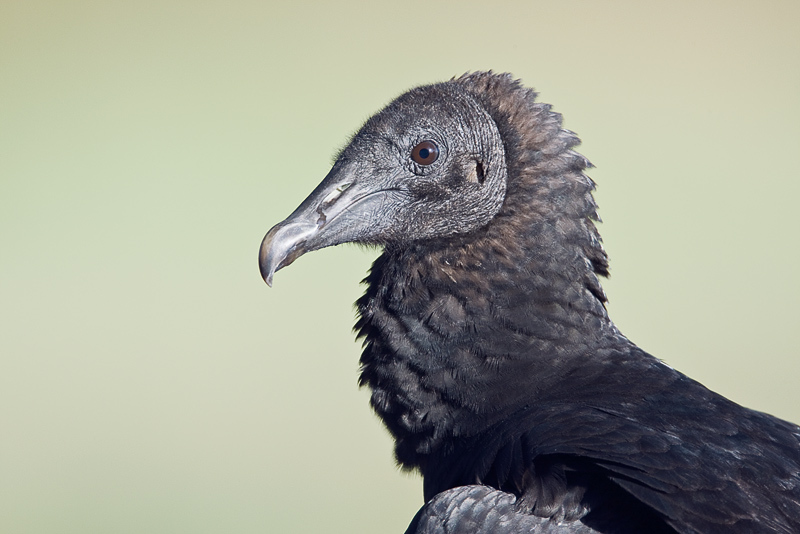 Our talking revealed her history as a freelance writer and my interest in bird photography. With our shared passion for the outdoors and artistic interests, we decided we should someday collaborate on a project combining our talents. 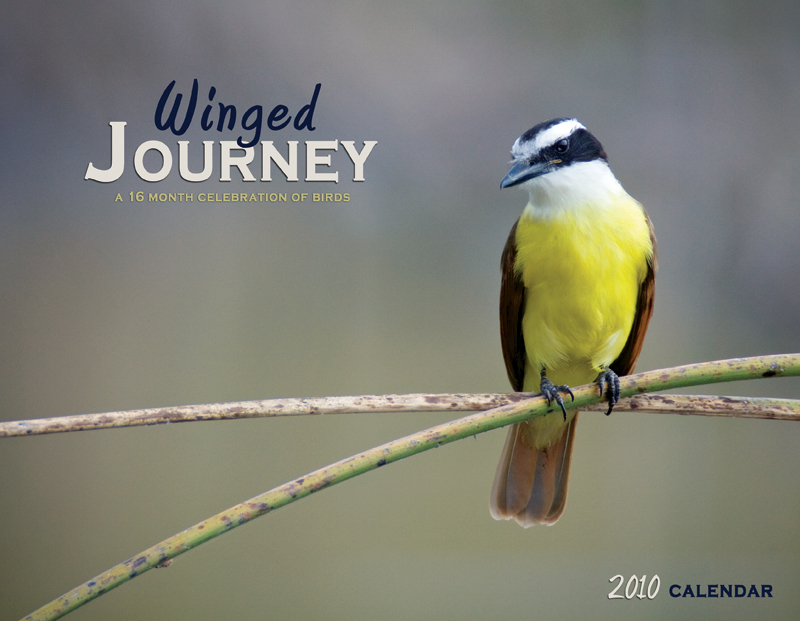 That idea came to fruition this summer and we are very proud of and excited to announce our calendar of birds for 2010. Winged Journey: A 16 Month Celebration Of Birds is the title of our work and features Sally's poetry and my bird photography. We have chosen birds from across North America to represent this year and each month contains an image with complimenting verse. In lieu of the traditional legal and religious holidays we have included events that celebrate our connection with the natural world. Simple things that often go unnoticed, such as full moons, equinoxes and solstices, as well as days honoring wildlife, oceans, and forests are just a few examples of the highlights throughout the month. The calendar is 28 pages and printed on a quality heavyweight matte-finish paper made of 40% recycled material. The design and feel of this calendar is simple, yet elegant. It measures 11x17 when open. We put in a lot of effort to make sure the calendar is not only of the highest quality, but also environmentally friendly. We are also very excited to be supporting the Black Swamp Bird Observatory in Ohio (where Sally and I met) with a portion of our proceeds from the calendar. We look forward to giving them a big check to support the research and educational programs at the Observatory. To learn more about them, please visit www.bsbobird.org. This calendar will make the perfect gift for the nature lover in your family or an excellent holiday gift for anyone you know. To order, please visit our website at www.wingedjourneycalendar.com or feel free to call or email me. They are 14.95 each plus shipping. Be sure to get one for yourself too. Our calendar has a different twist, so if you already have one, you need this one too!